417-083 Could the Intraosseous Fluid in Cancellous Bone Bear External Load Significantly within the Elastic Range? 417-201 Bone Ultrastructure – Collagen-reinforced Mineral Matrix or Interpenetrating Network of Hydroxyapatite Crystals and Collagen Molecules? 417-068 Texture-based Tissue Characterization: A Novel Predictor for Brain Injury? 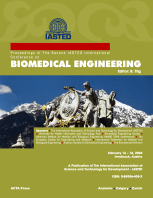 This publication covers the following topics: Biomechanics, The Cardiovascular System, Magnetic Resonance Imaging, Medical Imaging And Image Processing, Medical Signal Processing, Bio-Informatics and Medical Informatics, Health Care Information Systems, Health Care Technology, Modelling, Simulation, Systems, and Control, and Medical Devices, Measurement, and Instrumentation.